TEXT WRITTEN IN RED INDICATES WE ARE MISSING INFORMATION - if you have the answer, please contribute it via Email to us. Also, if you know of any toy that is missing from this list, please email us. # 11 - Display Holder For #932 Amusement Park 1963-1965. Unknown what this looks like. Accessories: Unknown. '73 - Green body afro-am. boy (red cowboy hat); turquoise boy (sideways red cap, smiling); red girl (blonde pony tail, fancy eyes); blue girl (blonde braids). '74 - Same as '73. '77 - Red body Afro-am. boy (yellow cowboy hat); yellow boy (smiling, red cap faces forward); red girl (blonde bob with bangs); blue girl (rust hair in bob - no bangs). # 117 - "Barnyard Friends" 1972-1975. 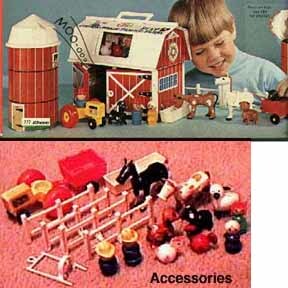 (Set of barn accessories). Accessories: 6 fence pieces (older style, with scalloped edges and no wood grain on posts), red chicken (rooster), white chicken, brown dog with black spots, white sheep with black ears, black pig with white ears, white cow with brown ears, brown horse with black mane and tail, and a white water trough. '75 - Red girl (blonde braids); turquoise boy (smiling, sideways red cap); same dog as '71 except yellow collar. Also seen with the '75 variation with turquoise boy with red cowboy hat, and the '71 variation with red boy frowning and yellow sideways cap, and yellow collar dog. Other reports have seen this with a blue boy with red sideways cap and frowning, or a straight sided dog with white collar. Appears to also have come with a regular sided dog with red collar (maybe in '76?) - one set like this was seen with inluded the dog, a girl (blue, blonde braids) and a boy (turquoise, yellow cowboy hat) - both people were wood/plastic, and it is likely the dog was too. 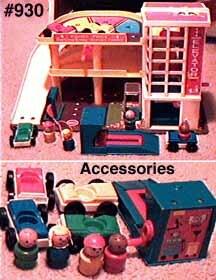 # 123 - Play Family Vehicle Assortment 1979-1985. 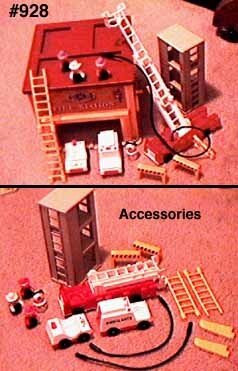 Set incorporates #124 Fire Engine, #125 Policecar, #126 Ambulance, and #127 Mail truck. Accessories: (See accessory lists for #124 - #127). # 124 - Fire Truck 1978-1990. Fire engine play set. 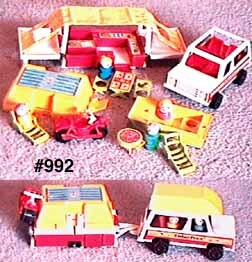 Accessories: Small fire truck with yellow ladder (main part, and one extention), black body fireman with freckles, white arms and hat (seen without freckles in '89 catalog). # 125 - Police Car 1978-1990. Blue and red police car. Accessories: Yellow hair/blue cap policewoman, yellow 25 MPH sign (it has been said that older versions had no border outline around the 25, newer ones had borders - however, the '89 catalog does not show a border). # 126 - Ambulance 1978-1984. Ambulance. Accessories: White doctor with white body. # 127 - Mail Truck 1978-1984. Mail truck play set. Accessories: Mail truck with blue bugle on side, gray body driver. # 135 - Play Family Circus (Photo) 1974-1976. Circus set. Accessories: 2 yellow ladders with a "bump" in the middle (a step to support one person standing half way up - step is reinforced by half-circles that extend from the sides), red hoop, yellow trapeze, blue ladder stand (tub-shaped stand with 4 stars around base and slot in top for end of ladder - to hold ladder upright, also has a plastic bottom with litho of a clown and some words), yellow ladder connector (sort of "H" shaped - joins 2 ladders end to end), 5 animals (grayish brown bear with tan oval patch on tummy and tan snout, brown monkey with tan snout and long curled black tail, lion with black mane and tail with tuft, blue elephant with gray ears, giraffe with black horns and orangish brown spots on legs and body), and 2 people (short ringmaster and wood body red clown with plastic head and yellow pointed hat). # 136 - Play Family Lacing Shoe (Photo) 1965-1970. Wood base shoe with wood tongue and top, and plastic toe and sides. Toe lifts up on hings. This is the first set to carry the name "Play Family...". Accessories: Shoe lace (braided red and white, or blue and white) and 6 figures, all wood: Full skirted (does not narrow down to fit in Little People holes) mom (blue body/white hair/glasses), girl - Susie (yellow body/triangle base/smiling/hair bow), girl - Freckles (yellow body/triangle base/freckels/frowning), boy - Butch (red body/square base/smiling/freckles), boy - PeeWee (red body/square base/smiling), and marshmallow (fat base) black dog. '71 - Orange boy (bald); green dad (bald); blue girl (blonde, braids); blue mom (blonde ponytail); Lucky (dog) with red or yellow collar. '73 - Same as '71, except dog has red collar. '75 - Same as '71 except: blue girl (brown bob); dog has red collar. '90 - blue girl (blonde sculpted bob); yellow girl (brown bob); red woman (black ponytail); green dad (black molded hair). # 146 - "Pull-A-Long Lacing Shoe" (Photo) 1970-1975. Wood base shoe with yellow plastic pull cord, wood tongue and top, and plastic toe and sides. Toe lifts up on hings. Accessories: White and blue braided shoelace, and 6 figures, (wood body and head in early years, plastic head later - except dog - always wood): Regular skirted mom (blue body/white hair/glasses), girl - Susie (yellow body/triangle base/smiling/hair bow), girl - Freckles (yellow body/triangle base/freckels/frowning), boy - Butch (red body/square base/smiling/freckles), boy - PeeWee (red body/square base/smiling), and a marshmallow (fat base)black dog. Variation reported: The fat base dog was replaced by a regular sided lucky in wood body and plastic head. 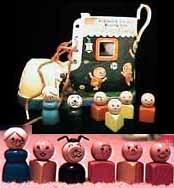 # 151 - "Goldilocks and 3 Bears Playhouse" (Photo) 1967-1970. House on wheels with openable roof, plastic pull string with key on end (fits play lock on the house roof). Accessories: 3 wood/plastic bear figures with red square (Papa), blue round (Moma) and yellow triangle (baby) bases, and blue all-wood girl with blond hair in braids. # 168 - "Snorky Fire Engine" 1960-1961. White base fire engine with yellow ladder that cranks up and down while basket on end holds the person upright. Has rope fire hose. Accessories: 4 green body, red hands and hat firemen with rivets running though their heads, and a conical shaped black dog with pointed black face. All bodies/heads are wood. # 169 - "Snorky Fire Engine" 1961-1962. 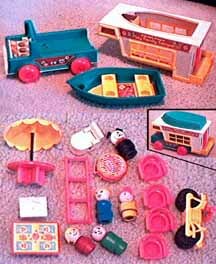 Play fire engine set. 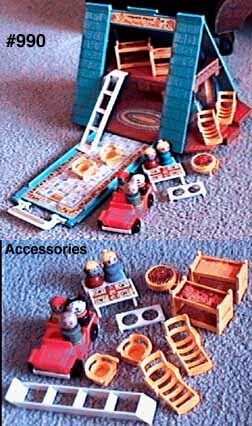 Accessories: Ladder truck with crank that moves ladder up and down (basket at end of ladder), 4 firemen (white bodies/red hats and arms). 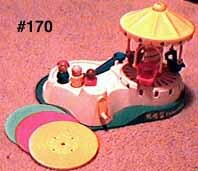 # 170 - "Change-a-Tune Carousel" (Photo) 1981-1983. Little people carousel chair ride with music box (plays "records" by turning crank handle, while swinging chairs around). Accessories: 3 records (lettered A, B, and C), orange body afro-am. boy (bald), yellow boy (bald), and blue girl (rust color hair in bob). Record colors came in mixed sets of pink, yellow and blue. # 182 - Airplane (Photo) 1981-1984. White top/green bottom airplane with yellow wings, with smoked plastic windshield covering cockpit and yellow plastic pull string. Accessories: 1 brown square and 1 blue roundish luggage, 4 figures: dark green dad (bald), orange boy (bald), yellow mom (brown hair, pony tail), lime green girl (rust color hair in bob). Note: '83 catalog shows a green boy (bald). 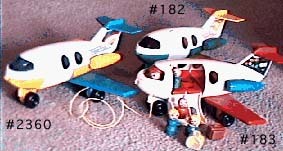 # 183 - "Play Family Fun Jet" (Airplane) (Photo) 1970-1980. White airplane with red wings and blue engines, and open cockpit. Pilot moves head as plane is pulled via yellow plastic pull string. Accessories: 1 round light green and 1 rectangular yellow luggage, 4 figures: blue mom (blond), green dad (bald), orange boy (bald), blue girl with either rust color hair bob ('70, '74, '76 - '80) or blonde braids ('71 - '73, and '75). '65 Display in Toy Town Museum (East Aurora, NY) - Green girl (red bob with bangs, freckles); blue girl (red ponytail, fancy eyes); red girl (blonde braids); red boy (yellow pot hat); blue boy (freckles, frowning, sideways yellow cap); green base afro-am. boy (red cowboy hat); regular sided tan Lucky (dog) with red collar. 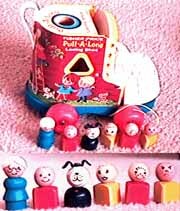 '67 Dealer's Catalog - Green girl (red bob with bangs, freckles); blue girl (blonde ponytail, fancy eyes); red base boy (yellow cowboy hat); blue boy (freckles, frowning, sideways yellow cap); green boy (red pot hat); red girl (blonde hair in bob); straight sided Lucky (dog) with yellow collar. '68 Catalog - Green girl (red bob with bangs, freckles); blue girl (blonde ponytail, fancy eyes); red base boy (yellow cowboy hat); blue boy (freckles, frowning, sideways yellow cap); green boy (red pot hat); red girl (blonde hair in bob); regular sided tan Lucky (dog) with red collar. '69 - Green girl (red bob with bangs, freckles); blue girl (red braids); red girl (fancy eyes, blond, ponytail); red base boy (yellow pot hat); blue boy (freckles, frowning, sideways yellow cap); green boy (freckles, red cowboy hat); straight sided Lucky (dog) with red collar. '73 - Green girl (red hair in bob with bangs, freckles); blue girl (red braids); red girl (fancy eyes, blonde ponytail); green base afro-am. boy with red cowboy hat; blue boy (freckles, frowning, sideways yellow cap); red boy (yellow pot hat); regular sided Lucky (dog) with red collar. '81 - Red base afro-am. boy with yellow cowboy hat; blue boy (freckles, frowning, sideways red cap); blue girl (fancy eyes, red ponytail); red girl (blonde bob); lime green girl (brown bob); green boy (red pot hat); regular sided Lucky (dog) with red collar. NOTE: The dog in the #192 may have been called "Fido" vs. "Lucky". # 234 - "Nifty Station Wagon" (Photo) 1960-1962. Station wagon/convertible with fold-down tailgate. 2 back seats have mechanism to make passengers spin when the toy is pulled (kind of like real kids do in the back seats!). Eyes move and makes motor sound when pulled. 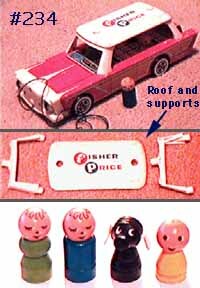 Accessories: Wood roof (says "Fisher Price" on litho), 2 removable plastic roof supports, 4 wood people - taller and wider than regular straight sided people. 1) Blue dad (very thin circle cut in to base about 1/3 up, closed eyes, triangle mouth, dot nose, slightly curled brown hair painted on, 2) Green mom (depression around waist to from hips and bust, closed eyes, dot nose, triangle mouth, same hair as dad), 3) Yellow child (no hair, dot eyes, crooked smile, no nose, body tapers from about 1/3 up to the neck), 4) Black dog (white eyes and dot on nose, white plastic ears, body tapers from about 1/3 up to the neck, with 2 thin circles around the body at about 1/3 and 2/3 up base). # 340 - Little Truck Rigs- Bulldozer (Photo) 1980-19??. Orange/yellow constuction vehicle. Accessories: Green construction worker (silver hat, orange scarf, no moustache). # 341 - Little Truck Rigs- Scoop Loader (Photo) 1980-19??. Orange/yellow constuction vehicle. Accessories: Blue construction worker (silver hat, orange scarf, moustache). # 342 - Little Truck Rigs- Dump Truck (Photo) 1980-19??. Orange/yellow constuction vehicle. Accessories: Blue construction worker (silver hat, orange scarf, moustache). # 343 - Little Truck Rigs- Forklift (Photo) 1980-19??. Orange/yellow constuction vehicle. Accessories: Green construction worker (silver hat, orange scarf, no moustache). # 344 - Little Truck Rigs- Helicopter (Photo) 1981-19??. 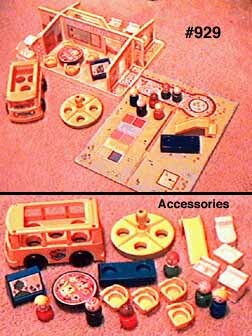 Accessories: Green and white truck and trailer with gray snap-on helicopter landing pad; yellow, square seat, black rudder helicopter; tall blue pilot; tan construction worker (silver hat, orange scarf, no moustache). # 345 - Little Truck Rigs- Boat Hauler (Photo) 1981-19??. 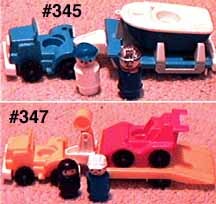 Accessories: Blue and white truck and trailer with snap-on boat holder; blue and white speed boat, and 2 figures: skipper (white body and blue "M" cap), dark blue worker (silver hat, orange scarf, moustache). # 346 - Little Truck Rigs - Fire Truck Rig (Photo) 1983-1989. Play fire truck set. Accessories: Long red fire truck with ladder that has base plus 2 extensions. Basket on end of last extention (same truck as went with Little People Fire Station, except this one has gold or white design under the cab doors), 2 yellow truck braces, and 2 black body firemen (silver hats, white hands). Variations: '85 - fireman have red hat and hands, '89 - one fireman has red hat/hands, the other has white. # 347 - Little Truck Rigs - Indy Racer (Photo) 1983-1990. Racing team set. 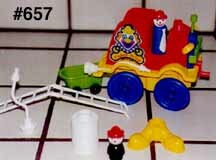 Accessories: Truck and tilting flatbed trailer (both are yellow/white), red race car (same as #2351), and 2 figures: Black body race driver with black helmet, and tall blue truck driver with white engineer hat and boy face ('89 catalog shows tall blue truck driver with blue engineer hat and boy face). # 396 - Little Truck Rigs 1980-19??. Set includes #344, #345, #346, and #347. Accessories: (See accesories for each of the individual sets included). 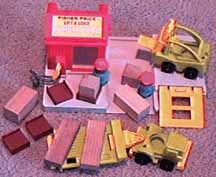 # 397 - Little Truck Rigs Assortment 1981-19??. Set includes #344, #345. Accessories: (See accesories for each of the individual sets included). 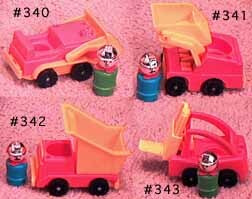 # 398 - Little Trucks Assortment (Photo) 1981-19??. Set of 4 construction vehicles. Accessories: Scoop loader, bulldozer, dumptruck, fork lift - all vehicles are orange and yellow. 1 brown pallet, 1 gray crate, and 4 figures: 2 light blue construction workers (silver hats, orange scarves, moustache), and 2 green construction workers (silver hat, orange scarf, no moustache). # 635 - Airlift Copter (Photo) 1983-19??. Blue/white helicopter with yellow rotor and lifting hook. Accessories: Orange lifting cage, light brown crate, and 1 figure (tall green pilot). # 636 - "Farm Friends" (Photo) 1983-19??. Green tractor and yellow cart (or vise versa). Accessories: Tall blue farmer (yellow cowboy hat, yellow triangle scarf); Lucky (dog) with red collar; red chicken (rooster). Variation: Orange triangle scarf. # 656 - "Little Riders" (Photo) 1976-1990. Set of play riding toys for Little People kids. 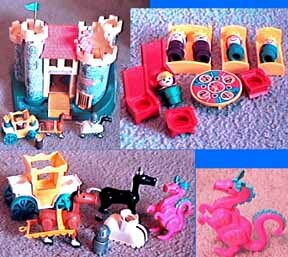 Accessories: Airplane, riding horse, tricycle, wagon and train - set comes with 4 colors (red, orange, blue and green). As a set - horse and plane are same color; trike and train are same color; wagon is one of the 2 colors left. 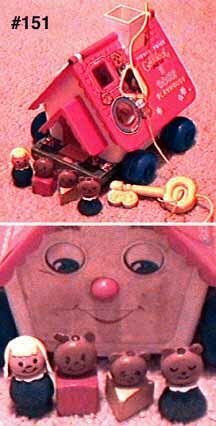 However, '89 catalog shows blue plane and horse, and red, orange and green trike, wagon and train (respectively), so the rule apparently does not apply in '89. Figures: Red girl blonde hair in bob (brown bob in '86, '87 and '89); yellow boy (freckles, smiling, forward facing cap). Earlier sets show "Made in U.S.A." on bottom. Variations included boy without freckles (e.g., '89 catalog) and rider colors that don't always match the general set rules given. # 657 - "Crazy Clown Brigade" (Photo) 1983-19??. Red top circus car with yellow bottom and blue wheels and radiator. Wheels wobble, eyes move, and green bumper and radiator cap move up and down as car is pushed. Red crank on front makes noise as it is turned. Silver/colored "Fisher Price" sticker on side. 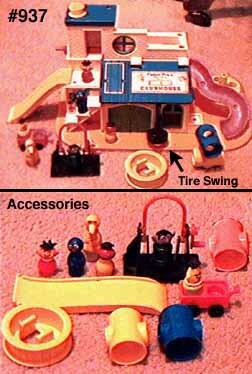 Accessories: Tall blue clown (white or yellow tie), short black body clown (both clowns have red or white fireman hats), 1 set of big yellow feet (connected, little people fit in middle hole), green bathtub on black wheels (coupler on front to pull behind car), 2 white 5-rung ladders (can connect together) with last 1/2" bent at 45 degree angle (so ladders are not straight), 2 crooked white hoses, white hose reel. '66 - Included: blue boy red cowboy hat, red girl blonde bob with bangs, blue mom white hair in bun, green dad bald, red boy yellow sideways cap with freckles and frowning ("Butch"), regular sided Lucky (dog) with red Collar, and a green bodied red haired girl, with freckles, smiling and ''' eyebrows. '69 - Red girl (blonde bob); blue boy (freckles, frowning, sideways red cap); green dad (bald); blue mom (white bun); green girl (red braids, freckles); red boy (yellow cowboy hat); straight-sided lucky (dog) with red collar. '71 - Red girl (blonde braids); blue boy (red cowboy hat); red boy (frowning, sideways yellow cap); green dad (bald); blue mom (white hair); green girl (red bob); straight-sided lucky (dog) with yellow collar. '73 - same as '69 except regular-sided Lucky (dog) with red collar. '75 - same as '69 except green girl has rust color hair and freckles, and regular-sided lucky (dog) with blue collar. '77 - same as '75 except dog has red collar. Variation: MIB set seen with '69 people and straight sided Lucky (dog) with white collar. # 675 - Little People Assortment - Circus Clowns (Photo) 1984-1990. Set of 3 play figure Circus Clowns. Accessories: Purple with yellow cone hat (+ + eyes); green with blue top-hat; orange body with black felt hat and blue or yellow scarf (+ + eyes). Some years the purple clown was replaced by red. '89/90 catalogs show red clown with yellow scarf. # 676 - Little People Assortment - Westerners (Photo) 1984-1990. Set of 3 play figure Western People. Accessories: Tall mayor (taller version of the ringmaster - black top hat, white bib collar); tall green man with 10 gal. cowboy hat, mustache, and a red scarf; red body Native American with white headdress with blue markings, blue scarf, and blue or black breastplate markings on front (no breastplate in '84, '87 and '89). # 677 - Little People Assortment - Farm Family (Photo) 1984-1990. Set of 3 play figure Farmers. Accessories: Green dad (tall white hat, yellow scarf); red mom (blonde ponytail); blue girl (blonde sculpted bob). Variation: Girl is yellow with black sculpted bob, '89/90 catalogs show red mom with blonde bun. '89/90 catalogs show variation set listed above. 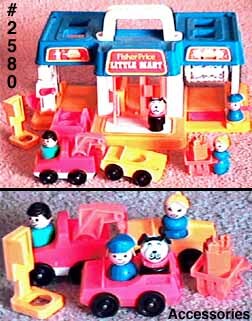 # 679 - Little People Assortment - Garage Squad (Photo) 1984-1990. Set of 3 play figure Auto Mechanics. Accessories: Tan worker (yellow scarf, silver hard hat, no moustache); green afro-am. worker (white scarf, yellow hard hat); light blue worker (orange hard hat and scarf). Variation of this set included darker blue man (orange hard hat and scarf); light blue afro-am. man (orange hard hat and scarf); and green worker (yellow hard hat and scarf) (this set shown in '89 catalog). Another variation was green afro-am. man with yellow hard hat and orange scarf, light blue worker with orange hard hat and scarf, and dark blue worker with orange hard hat and scarf (all workers have eyebrows). Variation purchased in Canada in 1984: Tan worker with moustache, orange scarf, silver hard hat; light blue afro-am worker, orange scarf, orange hard hat; green worker, orange scarf, silver hard hat. 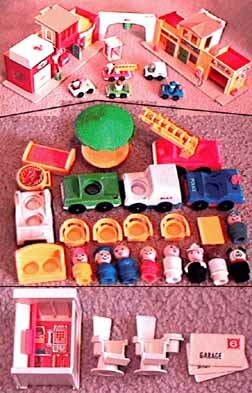 # 680 - Little People Assortment 1984-1990. 24 piece assortment includes bulk pack of #675 (Circus Clowns) (6), #676 (Westerners) (4), #677 (Farm Family) (6), #678 (Airport Crew) (4), and #679 (Garage Squad) (4). The '90 catalog indicates this also came with 2 trays for shelf display. Accessories: (see individual sets for listings of accessories). # 683 - Animal Pals (Monkey) 19??-19??. Individually packaged animal with picture of the real animal on the package. Accessories: Brown monkey with dark brown tail. 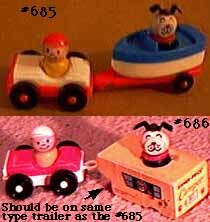 # 685 - "Car and Boat" Set (Photo) 1968-1969. Red and white car with C-shaped trailer hitch on back (or blue and white car), and white or red V shaped boat trailer with hitch in front. Blue and white (or red and white) boat with 2 holes in the bottom. '68 version of car has rivets in bottom, '69 does not. Accessories: Straight-sided yellow boy with red (or blue or white) front-facing cap; straight-sided Lucky (dog) with collar color matching boy's cap (normally). # 686 - "Car and Camper" Set (Photo) 1968-1970. Red and white car with C-shaped trailer hitch on back (or blue and white car), and white or red V shaped trailer with hitch in front (looks like a boat trailer - same as the #685 trailer). Wood camper (about the size of a fist) with yellow lithos and a Little People size hole in the top. '68 version of car has rivets in bottom, '69 does not. Accessories: Straight-sided yellow boy with red (or blue or white) front-facing cap; straight-sided Lucky (dog) with collar color matching boy's cap (normally). # 686 - Animal Pals (Bear) 19??-19??. Individually packaged animal with picture of the real animal on the package. Accessories: Orangish brown bear with tan spot on tummy. # 699 - Animal Pals (Photo) 1983-19??. Set of 6 animals. Accessories: Orangish brown bear with tan snout and tummy patch; brown monkey with long curly brown tail; giraffe with black horns and orangish brown spots on neck and legs; lion with black mane and tail with tuft; white cow with brown ears and spots; and black horse with white mane. # 705 - "Mini Snowmobile" (Photo) 1970-1973. Plastic snowmobile with black or red runners (color matches windshield). Accessories: Snow sled (pulled behind snowmobile - runner colors match snowmobile's); turquoise boy (freckles, red cap facing forward, smiling); turquoise girl (red hair in bob); Lucky (dog) with red collar. '71 variant had boy with sideways cap and Lucky with yellow collar. '73 ad shows red runners. # 716 - "Play Family Tractor And Cart" (Photo) 1969-1971. Red tractor (yellow wheels) with yellow cart (red axels). Accessories: Blue boy (red cowboy hat); red chicken; white chicken. # 718 - "Tow Truck and Car" (Photo) 1968-1970. Tow truck set. Accessories: Tow truck with red or white windshield and tow boom with wire hook. Driver head turns side to side when pulled, blue and white car with C-shaped trailer hitch on back; straight-sided yellow boy (blue cap, smiling). # 719 - "Choo-Choo Train" (Photo) 1963-1967. Same small wood and plastic train used for Amusement Park - three cars are blue, yellow, and red (each has hole for 1 rider). Accessories: 4 straight-sided figures: light blue boy (bald, smiling); green boy (bald, freckles, smiling, ''' eyebrows); red girl (bow in hair, smiling, fancy eyes); straight sided black dog with pointed face and yellow droopy ears. Rumor has it that the dog is shorter than the dog that went with the #969 Ferris Wheel. # 720 - "Play Family Fire Engine" (Photo) 1968-1979 and 1987. Wood fire engine with ladder (has 1 extention), and a red and yellow shoestring "hose". Bell rings and driver head (wood on earlier ones) turns both ways as truck is pulled. Red windshield and ladder through '72, white thereafter. Early ones had a wood headed driver and narrow post in the back of the truck. 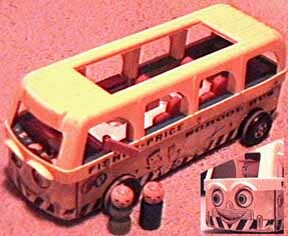 Later ones had a plastic head driver and a wider post (which the early wood people will not fit over). 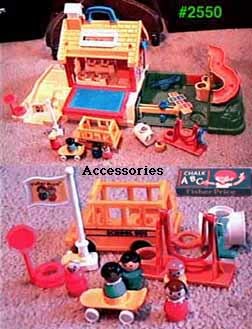 Accessories: '68-'72 - fireman (white hat, red arms, freckles). '73-'79 - fireman (white hat and arms). '87 - ("Classic Edition") came with no fireman, but came with a book on Fire Engines. It is theorized that the early verions of this fireman may have come without a collar behind his neck - however, this is Unknown. '72 - Yellow toilet (turquoise lid), yellow sink and tub; turquoise captain chair (no triangle on back); turquoise scale; turquoise base yellow top sewing machine; lime washer and dryer; all wood figures - green dad (bald); blue mom (blonde ponytail); blue girl (blond braids); orange boy (bald). 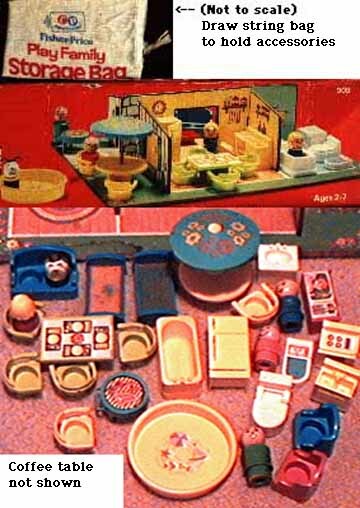 '73 - Yellow seat and lime green toilet, lime green sink and tub; yellow scale and captain chair (no triangle on back); yellow base lime green top sewing machine; turquoise washer and dryer; 4 wood figures - (see '72). '74 - Toilet - turquoise with a lime green lid (toilet base matches sink and tub), turquoise sink and tub; lime green captain chair (changed to triangle on back) and scale; lime green base turquoise top sewing machine; yellow washer and dryer; 4 figures. '77 - same as '74 except yellow scale. All years use captains chairs without triangles on back. One reader got this for Christmas in 1970, so maybe this was released midyear? Her set included: umbrella table yellow base/turquoise top (yellow & orange flowers), yellow pool printed with orange and turq. toys, turq. grill, 2 yellow chairs, 2 orange chairs, green dad, blue mom, blue girl blond braids, orange bald boy. '71 catalog - Rust brown double bed, sofa, stuffed chairs (2), and round table with checkerboard litho; 2 mustard twin beds, coffee table and a TV; green dad (bald); blue mom (blonde ponytail); blue girl (blonde, braids); orange boy (bald). '72 - Orange double bed and stuffed chairs (2); yellow sofa and round table with checkerboard litho; 2 rust brown twin beds, coffee table and a TV; same people as '71. This set is also reported to have come with yellow double and 2 twin beds; orange TV and coffee table; rust brown checkerboard litho round table; rust brown sofa; 2 yellow stuffed chairs; same people as prior years. Other variations appear to include an orange checkerboard table and gold beds..
'71 - Yellow stove with litho; yellow double sink and refridgerator; lime green rectangle table with formal setting litho; 2 brown and 2 lime green captain chairs; green dad (bald); blue mom (blonde ponytail); blue girl (blonde, braids); orange boy (bald). '73 - same as '71 except table is brown (chairs same as '71). Captains chairs do not have triangles on back through '73, after that, they probably do. '73 - Turquoise base, yellow top changing table; pink high chair and rocking horse; turquoise cradle; yellow play pen and stroller; green dad (bald), blue mom (blonde ponytail), blue girl (blonde braids), white baby with yellow bib. '75 - Yellow base, pink top changing table; turquoise high chair and rocking horse; yellow cradle; pink play pen and stroller; green dad (bald), blue mom (blonde ponytail), blue girl (rust hair in bob), white baby with yellow bib. '81 - Turquoise base, yellow top changing table; pink high chair and rocking horse; turquoise cradle; yellow play pen and stroller; same people as '75. Other color variations exist. Known pieces include pink base changing table with turquoise top, yellow rocking horse, pink cradle, turquoise playing pen, and turquoise stroller. # 789 - "Lift and Load Road Builders" (Photo) 1978-1982. Set of construction workers and equipment. Accessories: Green/yellow scoop loader and dump truck, gray crate, 2 black barrels, 3 gold pylon barricades (each consists of 2 pilons contected by a plastic strip between them), gold 25 MPH sign (black border around sign), gold worker sign (square sign with red triangle, symbol of man shoveling - inside triangle), 1 caucasian and 1 afro-am. light blue worker (orange hats and scarfs). # 875 - "Play Family Auto Set" (Photo) 1978-19??. 4 single seat cars (same as those sold with the #930 Garage): blue/white, red/white, yellow/white, green/white. Accessories: Lime green girl (rust brown hair, freckles), yellow boy red cap (facing forward), red girl (yellow hair in bob), orange boy (bald). # 876 - "Play Family Service Vehicles" 19??-19??. Same set as #123, but fireman has white helmet, freckles and red arms; afro-american doctor; and mail truck has only "mail" in red letters. Accessories: (see #123). # 909 - "Play Family Play Rooms" (Photo) 1971-1974. 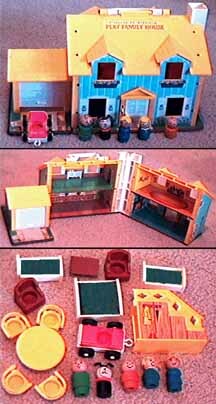 Open, 4-room play house (no exterior walls or roof). Sold only by Sears. Accessories: Kitchen: Rectangular lime green kitchen table with formal settings and 4 captains chairs (no triangles on back); yellow double kitchen sink, stove (with litho of 4 burners) and refrigerator. Living Room: Red or blue TV set with litho of puppet show, 1 red and 1 blue arm chair, red or blue coffee table (color matches TV), red or blue sofa. Bedroom: 2 red or blue twin beds (color matches sofa). Bathroom: White bathtub, scale with litho, toilet and single sink. Patio: Turquoise or yellow wading pool with pool toys printed on bottom (color matches top of umbrella table); turquoise or yellow BBQ grill (color matches umbrella top), umbrella table with flower design on top (Table top color matches pool, umbrella color matches BBQ grill) with 2 chairs (color matches table top). White cotton drawstring bag. People (all wood, or wood and plastic): Green dad (bald), blue mom (blonde ponytail), red girl (blonde bob), orange boy (bald), straight sided Lucky (dog) with yellow collar. Known variations include wood and plastic people vs wood only, blue girl with blonde braids, and a yellow bathtub. Variation found in both a '70 "Woman's Day" magazine ad, and a '71 J. C. Penny's ad) - Same as '69 except the people and animals are all different: White horse with brown mane, brown cow with white spots, black dog with white spots and ears, brown pig (white ears), black sheep (black ears), red chicken (rooster), white chicken, blue dad red cowboy hat and yellow triangle scarf, yellow mom with white hair in a bun, blue boy with red cowboy hat, and green girl with freckles and yellow braids. Variation on the pig: It appears that there are several brown pigs with black ears out there - it is likely that this is a '69 variation. For your amusement, here is a list of the names that have been reportedly seen on an original box: Farmer and Mrs. Brown and their kids Cathy and Clem. Animals are Rusty Rooster, Henrietta Hen, Horace Horse, Wooly Lamb, Spot the Dog, Pudgy Pig, and Bossie the Cow. # 916 - Zoo (Photo) 1984-1987. Zoo base with attached lion (slides in and out of cave), hippo head (mouth opens when tram drives across road), and lever that swivels perch for vulture. Accessories: Orange aviary building (sits on top the main building by the hippo area), tan bird tree, 1 orange and 1 yellow parrot, 1 black and 1 orange monkey, blue vulture, dark gray seal, blue elephant, yellow lion cub, brown or blue hippo, orange gorilla, brown or blue mountain goat, 4 food trays (square, triangle, oval, round - each is a different color), 2 green benches and picnic table (no litho), 3-piece zoo tram (turquiose with white top truck and passenger car, brown "feed car"), 5 figures: Green dad (molded black hair), red mom (black hair), orange boy (yellow cap facing forward), blue girl (blonde hair in bob), green man (tan hat, yellow scarf, mustache). Variations in later years: Blue dad (bald), blue dad (brown molded hair), red mom (blonde ponytail), orange boy (bald), yellow boy (red cap forward), yellow girl (brown hair in bob), and the 1987 version came with blue vs. green picnic table and benches. Also, the zookeeper came in light and dark green - the dark green version came first. Variations: Green girl (rust hair bob, freckles), green girl (rust, no freckles), red girl (blonde bob), blue girl (blonde braids), orange boy (bald), yellow boy (red cap facing forward). # 928 - Fire Station (Photo) 1979-1982. Station with door that rings bell as it moves up via crank. Accessories: Fire ladder truck (no design on side - different than the #346) with 2-extention ladder and basket on end, 2 black rubber hoses (both have female fittings on one end, and one has a male fitting on the opposite end, while the other has a larger "nozzle"), white/red ambulance, white/red fire chief car, 2 seven rung yellow ladders, 2 yellow baricades (with black stripes), 2 yellow truck stabilizers, and a grey plastic "practice structure" tower, 4 figures (2 firemen with black bodies and red hats and hands, 1 fireman with white hat and hands, dalmation dog). # 929 - "Play Family Nursery School" (Photo) 1978-1986 and 1989. 4-room nursery school base has a lift-off cardboard roof that reverses to show a playground and sidewalk. 1989 version sold exclusively at "Lionel Kiddie City". Accessories: Yellow school bus with apple and textbook litho, white single sink and commode, white kitchen double sink and stove with 4 burner litho, round blue table with crafts projects litho and 4 yellow captains chairs, blue painting easel with litho, blue teeter totter, yellow or green slide, yellow and green whirl-a-round, and 6 figures: Green dad (bald), blue mom (blonde ponytail), lime green girl (rust hair bob, freckles), red girl (rust hair bob), red afro-am. boy (bald), green boy (bald). Variation found in an unopened package: The stove has a yellow vs. white litho. The people are: boy/orange/brown molded hair, girl/blue/blonde/bob, mom/blue/blonde/ponytail, girl/red/dark brown/bob, dad/green/black molded hair, boy/blue mexican. The writing on the package is in both English & Spanish. '73 - same as '70 except cars have white bottoms. # 931 - "Play Family Children's Hospital" (Photo) 1976-1978. Building has elevator with closing upstairs and downstairs doors, a rolltop garage door, and and a fold-down flap (front of building). 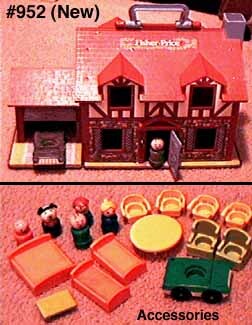 This was the first all-plastic Little People play set. Accessories: White/red ambulance; Turquoise parts: Gurney (with red wheels, white vecro strap), sink, working doctor's scale, working x-ray machine, 2 chairs (look like chairs to the 923 school, without the table in front), 2 twin beds, infant bed (cradle); White parts: Operating table (looks like a shallow bathtub with a low shower head), privacy screen (white screen with checkered appearance), wheelchair with red wheels; 7 figures: green dad (bald), blue mom (blonde ponytail) red girl (blonde bob), white baby with no bib, white smock nurse with white mask painted on face, 1 caucasian and 1 afro-am. white smock doctors. # 932 - "Amusement Park" (Photo) 1963-1966. 30" x 30" vinyl amusement park play mat. 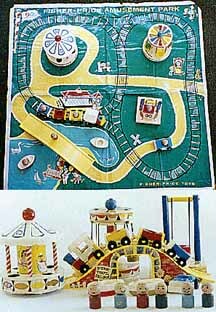 Accessories: Combination tunnel/bridge (plastic), 4-seat flying chair ride (wood base and top, plastic seats), merry go round (wood base and plastic top), 1-seat swing ride (wood base and sides, plastic seat), 4-piece train with 3 single seat train cars (blue, red, yellow - all in wood body with plastic ends and sides), 1 green and 1 red single seat cars (similar to #930 garage cars, but the wheels smaller (3/4" diameter) and are held on via plastic knob vs. metal rivet), 2 small 1-seat boats (in any of blue, green, yellow or red) and 7 straight sided figures (2 smiling dark blue boys, 2 green boys with ''' eyebrows and freckles, 2 red girls with fancy eyes, black dog with pointed face and white ears). Variations: Blue and yellow cars, light blue boys. Rumor has it that the dog is shorter than the dog that went with the #969 Ferris Wheel. # 932 - "Ferry Boat" (Photo) 1979-1980. Double deck ferry boat with moving baricades to keep cars from rolling, and a fold-down ramp at the rear. Floats, or use as pull toy with yellow plastic string. Set only made for a 6 month production run due to consumer complaints about the colors running off the lithos when wet. Accessories: 2 yellow life preservers, blue and white life boat, 2 white/green 2-passenger cars (back to back style), and 3 figures: tall blue captain (blue engineer type hat, moustache - same man as used in #945), orange afro-am. man (NOT Gordon from Sesame Street), blue mom (blonde ponytail). Variations: Also seen with 1 green/white 1-seater, and 1 green/white 2-seater (back to back). # 933 - "Jetport" (Photo) 1981-1985. Airport set with gray-base building. After 1985, set reissued as #2502. 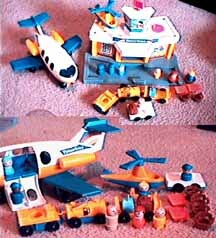 Accessories: Blue/yellow helicopter, white/yellow plane with blue wings (#933 on tail litho), 4 brown captains chairs, 2 orange coffee tables, green/white 2 seat car with luggage rack, 1 brown rectangle and 1 blue roundish luggage, airport service train (blue/yellow truck and fuel car, blue or yellow luggage car); tan man (bald), 2 short blue pilots (1 afro-am., 1 white), light blue short stewardess (blonde hair under hat), blue mom (blonde ponytail), yellow boy (bald), orange girl (rust hair bob). Helicopter variations had blue or yellow rudders and white or black triangles on rotor blades..
# 934 - Western Town (Photo) 1982-1984. Western building with moving walkway on roof, slide, trap door and chute. 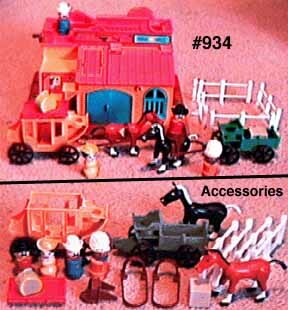 Accessories: Tan or green buckboard, tan or green (opposite of buckboard) stagecoach with red roof (removable), 1 brown and 1 black horse, 2 brown harnesses for horses, brown saddle, grey crate, green round luggage (hatbox), 4 white fence pieces (newer style, with wood grain on posts), 4 figures: Blue sheriff with silver or orange star, red man (black cowboy hat, moustache), orange Native American Chief (red painted breast plate and bonnet markings), yellow lady (green hat). The green stagecoach/tan buckboard combination is the most common - although an '83 ad has been reported that shows the reversed colors..
# 937 - "Sesame Street Club House" (Photo) 1977-1979. White club house with moving walkway, slide, trap door, and chute. Building has black tire swing attached on horizontal spring post. A bit of trivia: The clubhouse mold was later modified to create the #934 Western Town base. Accessories: Yellow slide (hard to find): 188mm long, 53mm wide, and the sides are 12mm tall. It is reversible (either side can be up), and the ends have a notch to keep it on the edge of the building. 3 snap-together play tubes or pipes (yellow, blue, red), yellow cable drum (with place inside to snap the people so they can roll in the drum), black+red jump rope, red 2-seat wagon with handle (which does not move), and 6 figures: The Count, Roosevelt Franklin, Grover, Ernie, Bert, and Big Bird. # 938 - "Sesame Street" (Photo) 1975-1978. 2-buildings (each with opening door) hinged together by wood "alley" scene with chalkboard on the back. Accessories: 6-rung white ladder (incl. top and base), TV with Grover on litho, sofa, coffee table, beds marked "B" and "E" on headboards, round table with pork chop platter and 2 place settings litho, 2 captains chairs (match table color), green sanitation truck, light pole with Sesame Street sign, red fire hydrant on grey triangle curb base, blue mailbox with "Mail" litho, grey newstand with litho, grey drugstore lunch counter with litho and blue seats, chalk and eraser, Big Bird's nest (brown), and 8 figures: Susan, Gordon, Mr. Hooper, Big Bird, Bert, Ernie, Cookie Monster, Oscar in his trash can). Furnitures is either gold, orange or brown (2 rooms of one color, 1 room of one of the other colors). 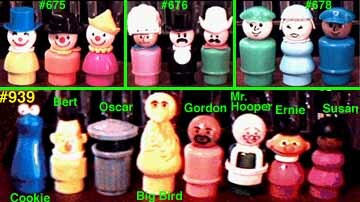 Note: Oscar's trash can has a handle on top of his lid in the '75 to '76 versions, and no handle in the later versions. # 939 - "Sesame Street Extras" (Photo) 1976-1979. 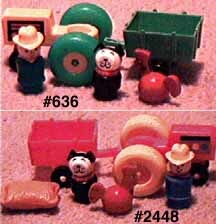 This is an accessory set of different characters for the #937 and #938 sets. Accessories: Set included Ernie, Bert, Cookie Monster, Susan, Gordon, Mr. Hooper, Big Bird, and Oscar in his can (according to one source, trash can lid should have a handle on top). # 940 - "Sesame Street Extras" (Photo) 1977-1978. 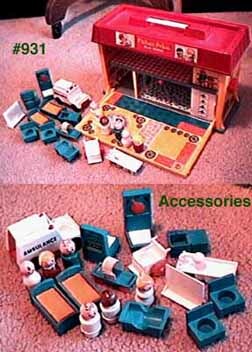 This is an accessory set of different characters for the #937 and #938 sets. Accessories: Set included Grover, The Count, Snuffleupagus, Sherlock Hemlock (green face, brown detective's hat), Herry Monster (blue), Prairie Dawn, and Roosevelt Franklin (purple face, black hair tuft). # 942 - "Lift 'n' Load Depot" (Photo) 1977-1979. Yellow crane on top of building with crank that runs black chain and hook up and down. Orange bucket runs up+down side of building via hand crank. Gas pump on side of building. Accessories: Green and yellow dump truck, front loader tractor, and fork lift; yellow sling (open basket with loop on top), orange bucket (mentioned earlier), 4 brown pallets, 2 black barrels, 2 grey crates and 2 brown crates, and 3 construction workers (light blue bodies, orange hard hats and scarves): 2 caucasian, 1 afro-am. # 943 - "Lift 'n' Load Railroad" (Photo) 1978-19??. Building with overhead crane (moves by hand crank), orange platform tilts up to load train cars. Part of train track molded into base of building. Accessories: 7 pieces of brown track (4 curves, 3 short straights - building forms the 4th straight section), 2-piece train (yellow wind-up engine, and an orange car with a booth in back and yellow flatbed that tilts), green/yellow fork lift, orange sling (open basket with loop on top), 4 golden brown pallets, 2 black barrels, 2 grey crates, orange truck ramp, and 3 figures (1 caucasian and 1 afro-am. construction worker (light blue bodies, orange hard hats and scarves), tall light blue train engineer with moustache and orange scarf). # 944 - "Lift 'n' Load Lumber Yard" (Photo) 1978-19??. Red building on gray base (has also been seen with a white base). Accessories: Green/yellow truck and trailer, fork lift; yellow ramp, 4 brown pallets, 6 stacks of lumber (real wood blocks with grooves to look like lumber) - 2 square (1.125" per side), 2 long rectangular (3.375" x 1.125" x 0.5"), 2 short rectangular (2.25" x 1.125" x 1.125"), and 1 caucasian and 1 afro-am. construction worker (light blue bodies, orange hard hats and scarves). # 945 - "Offshore Cargo Base" (Photo) 1979-1983. Set designed for either tub or floor. Accessories: 2 sets of black tow chains, 6 pieces of cargo (2 small brown crates with lifting loop on top, 2 plastic "feed sacks" (same as farm sets), 2 black bunches of pipe with lifting loop on top - 4 pipes in each bunch), mesh cargo net (tan nylon net with black plastic loops on each side), blue/white helicopter with "945" on side, red/white tugboat, blue/white barge, tan cargo hold/dock with detachable white cover with "Fisher Price" and compass on it, tan helicopter pad, red crane on tan base, 1 square and 1 rectangular black floatation ring bases (other parts fit into these rings), and 4 figures: tall blue captain with engineer cap and moustache (same as used in #932 Ferry Boat), 1 caucasian and 1 afro-am. construction worker (light green bodies, yellow hard hats, white scarves), red deep sea diver. '69 - Red/white car with C-shaped trailer hitch on back (this hitch was deleted somewhere during this set's production life), white beds (1 double, 2 twin), gold round table (no litho) and 4 captains chairs (no triangle on backs), 2 brown stuffed chairs and coffee table, yellow stairs with closet and litho, cardboard blue moving van (holds pieces), and 5 figures: Green dad (bald), blue mom (blonde ponytail), orange boy (bald), blue girl (blonde braids), black straight-sided dog (Snoopy) with red collar (often called "Lucky", but the back of the #952 shows it as "Snoopy"). (Another '71 variation seen in a J. C. Pennys ad) - Same '69, but no moving van. '73 - same as '69 except yellow double and brown single beds, white table/chairs, yellow stuffed chairs/coffee table, car has no trailer hitch, regular-sided dog (Snoopy) with yellow collar (often called "Lucky", but the back of the #952 shows it as "Snoopy"). A variation reported to us is that the table and chairs were seen in orange in a '69 set, however, we cannot confirm this, because we are told (by someone that works at FP) that orange was not used in furniture until the 1980's). One point of clarification is that the yellow furniture may have been gold in some or all years - the listing is based on pictures and advertisements, and it is not always possible to tell yellow from gold in the picture. 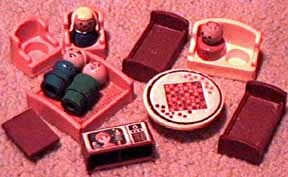 '80 - White/green single seat car with luggage rack; beds (1 double, 2 twin, all in same color), round table (no litho) and 4 chairs, 2 stuffed chairs and coffee table (all same color), and 5 figures: Green dad (bald), blue mom (blonde ponytail), orange boy (bald), blue girl (rust hair), black dog (Snoopy) with red collar (often called "Lucky", but the back of the #952 shows it as "Snoopy"). Furniture came in lime green, yellow, and orange. '87 - same as '86 except solid green 2 seat car back-to-back, green dad (black molded hair), coral boy (molded brown hair), coral girl (brown bob). 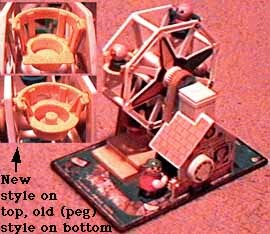 # 969 - "Musical Ferris Wheel" (Peg Seat Version) (Photo) 1966-1972. Wind-up music box ferris wheel plays "In the good old summer time" while turning 4 seats. Wooden head mad-face boy turns crank at ticket booth. (May have been introduced in 1964, according to one soucrce). Had pegs sticking up from the middle of each seat until 1972 - no pegs thereafter. Accessories: '69 - Red girl (made-up eyes, hair and bow painted on head), green boy ('''eyebrows, smiling, freckles), dark blue boy (smiling), black dog (black face, pointed nose, white ears). All figures have straight sides. The dog is rumored to have a taller body than the dogs that came with the #932 Amusement Park or the #719 Train - in fact, the short body dog does not really fit well into the seats. The dog probably also came with yellow ears, as a tall bodied yellow ear dog has been seen. '75 - same as '73 except red girl has fancy eyes and pony tail, and green Afro-Am. boy bald (no hat). '77 - same as '73 except blue girl (red ponytail), green Afro-Am. boy bald. # 979 - "Dump Truckers" (Photo) 1965-1970. Base with drive-up ramp for trucks to dump loads into hoppers. Hoppers empty back into the truck on lower level where trucks back into stalls the same shape as the truck bed. 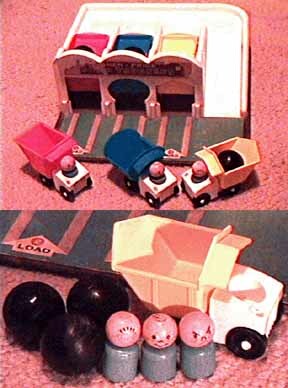 Accessories: 3 plastic trucks whose shapes/colors match the building's loading bays (red, blue and yellow), 3 black wood (earlier) or plastic (later) balls, and 3 light (earlier) or dark (later) blue boys with straight sides (1 smiling, 1 frowning, 1 freckles with '''' eyebrows). The wood balls are solid wood, and as we understand it, they are 1.5" in diameter. The plastic balls are hollow and made with 3 lines (one of which is a seam) running around the middle. The lines are about 1/8 inch apart, and there is also one hole about the size of a pencil point along the side of the 3 lines (maybe part of the manufacturing process?). # 983 - "Safety School Bus" (Photo) 1959-1961. Wood base with clear plastic top bus. Removable yellow roof on top. Opening door with spring to close it, four red wooden seats inside that the people don't actually sit on - they stand on the floor in front of the seat. Wooden wheels, wooden head driver, plastic rectangle stop sign swivels out from the driver window. Bus eyes move and driver's head turns as toy is pulled/pushed. 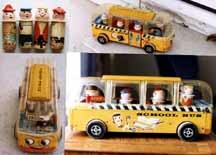 There is more than one version of this toy - in one version, the 2 back passengers are permanently mounted in the bus, and bounce up and down as the bus is moved. In the other version, the passengers are all removeable, and there is no mechanism to bounce the people. Unknown which version is older - so if you know, please tell us. On one hand, the #234 Nifty Station Wagon, made later, also had spinning people, so it would make sense for this version to be later. On the other hand, the non-spinning/bouncing people version has 2 extentions off the rear plastic axel assembly that serve no purpose other than to maybe have connected to bouncing people.... Accessories: 6 straight-sided Little People figures with lithograph-wrapped bodies and white plastic collars (all are flat disks, other than the girl): 1)Boy, fire hat, red/white striped shirt, books under arm; 2) Boy, blue flat-topped cap, white shirt, books under arm; 3) Boy, yellow hat, red open vest, books under arm; 4) Boy, yellow hat, red closed jacket; 5) Boy, red beret, frowning, yellow shirt; 6) Girl, blonde pony tail, smiling, white ruffled collar and litho with a red blazer and holding a blue school book. # 984 - "Safety School Bus" 1961-1962. Wood base with yellow plastic top bus. Opening door with spring to close it, 4 red wooden seats inside that the people don't actually sit on - they stand on the floor in front of the seat (the last 2 people have no seats behind them). 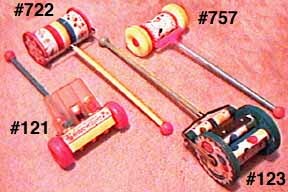 Wooden wheels, wooden head driver, plastic rectangle stop sign. Bus eyes are lithos (don't move, unlike the #983 and #990 buses) and driver's head turns as toy is pulled/pushed. Accessories: 5 wood people similar to #234 Nifty Station Wagon people - taller and wider than regular straight sided people. 1) Blue male (thin depression circles base about 1/3 up, dot eyes, triangle mouth, dot nose, parted hair painted on, 2) Green female (depression to form waist and bust, closed eyes, dot nose, triangle mouth), 3) Brown base male (no hair, dot eyes, crooked smile, no nose), 4) Red-orange female (depression to form waist and bust, 2 circles around the base below the waist, dot eyes, dot nose, triangle mouth, yellow hat riveted on), 5) Yellow girl (depression to form waist and bust, frowning, freckles, red beret riveted on). # 985 - "Play Family Houseboat" (Photo) 1972-1976. Boat has blue upper deck that hinges up from the back. Noise clicker when pulled. Yellow plastic pull string. Accessories: 2 yellow life preservers, red table (lobster and plates litho) with 2 red chairs, yellow BBQ, 2 yellow lounge chairs, blue and white speed boat, and 5 figures: Tall white captain (blue cap), blue mom (blonde ponytail), red girl (blonde bob), yellow boy (red cap facing forward, freckles, smiling), and Lucky (dog) with red or yellow collar. # 990 - "Safety School Bus" (Photo) 1962-1965. Wood base with yellow plastic top bus with opening door. Bus eyes move and driver's head turns as toy is pulled/pushed (similar to #984, but eyes move, like the #983). Accessories: 5 wood people similar to #234 Nifty Station Wagon people - taller and wider than regular straight sided people. 1) Blue male (thin depression circles base about 1/3 up, dot eyes, triangle mouth, dot nose, parted hair painted on, 2) Green female (depression to form waist and bust, closed eyes, dot nose, triangle mouth - same one from the #234), 3) Brown base male (no hair, dot eyes, crooked smile, no nose), 4) Red female (depression to form waist and bust, 2 circles around the base below the waist, dot eyes, dot nose, triangle mouth, yellow hat riveted on), 5) Yellow girl (depression to form waist and bust, frowning, freckles, red beret riveted on). '73 set captains chairs probably do not have triangles on back. # 991 - "Music Box Lacing Shoe" (Photo) 1964-1967. Shoe on wheels with lift-up toe. Knob on top winds music box. As music plays, a cylender turns showing a scene through windows in shoe. Accessories: Shoe lace (braided red and white) and 3 straight-sided figures: Red boy (freckles and ''' eyebrows), red boy (smiling), red girl (made-up eyes, smiling, bow in hair). 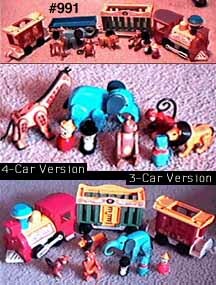 # 991 - "Play Family Circus Train" (4 car version) (Photo) 1973-1978. Engine with pull string and paper headlight lithos, blue or green cage car with giraffe litho on sides and clown lithos on ends, blue or green flatcar with lion litho, red caboose with monkey litho. 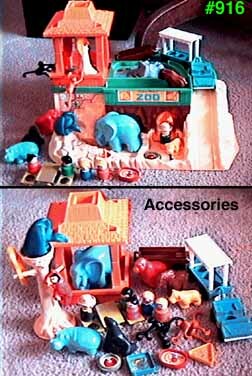 Accessories: Giraffe with black horns and orangish brown spots on neck and legs, lion (black mane), dark eared elephant, brownish-orange monkey, greyish brown bear, 3 wood/plastic figures (short blue train engineer, short ringmaster in black top hat, red circus clown with pointed yellow hat). # 991 - "Play Family Circus Train" (3 car version) (Photo) 1979-1986. Engine with silver imprinted headlights, blue or green cage car with lion litho on sides (no lithos on ends), red caboose with monkey litho. Accessories: Lion (brown mane), dark eared elephant, brownish-orange monkey, grayish brown bear, 3 all-plastic figures (short blue train engineer, short ringmaster in black top hat, red circus clown with pointed yellow hat). Variations had brownish-orange bear and brown monkey. # 992 - Car and Pop-up Camper (Photo) 1980-1984. Family pop-up camp trailer set. Accessories: White/red 4-seat jeep with fold-down rear seat and lithos on both sides, white/red pop-up tent trailer with yellow fabric tent sides, yellow clam carrier (yellow, hour-glass-shaped top that fits on top the pop-up trailer, between the 4 posts coming out of the middle of the folded-up trailer. Has white and green litho on top, and hook on back to hang the motorcycle), green/yellow boat (sits on top of jeep), 2 green lounge chairs, yellow BBQ grill with litho, green table with steak litho and 2 benches, red motorcycle, and 4 figures: Green dad (bald), yellow boy (red cap facing forward, freckles, smiling), blue mom (blonde ponytail), red girl (blonde bob). Variations: Green boy is bald, boat is solid green or yellow with green inside, red girl has rust hair bob. # 993 - Castle (Photo) 1975-1977 plus 'Classic Edition' issued 1987.. Castle with draw bridge. Building turret has flag on top (except Classic Edition). Accessories: Carriage (White and yellow with turquoise wheels), 1 black and 1 brown horse, white or yellow horse harness with scalloped bottom, white or yellow armor for horse (opposite color of harness), red or yellow furniture (2 tall thrones, 2 short thrones, round table with litho of 4 plates with steaks and serving plate with fruit in center (tablecloth is 2 red and 2 blue alternating quarter circles), double bed with crown on headboard, 2 single beds with crowns), pink dragon, and 6 figures (king, queen, prince, princess, silver knight, woodsman with green cap). Classic Edition figures are all plastic, older ones are wood and plastic (except knight - always all plastic). Thrones are opposite color of remaining furniture (red or yellow), except on classic edition - all the same color (one reader wrote in that their original edition castle also had one color furniture, so this rule apparently does not apply to all). Royal family is either purple or light turquoise. Wood/plastic (earlier) princesses have red hair in a bob, all-plastic princesses have blonde hair with buns by each ear. '73 - 5-seat green rowboat with yellow bench seats and litho inside (boat fits over top of camper); white single sink, narrow back commode; red ladder, yellow top/red base umbrella table, red table with lithos of hot dogs, 4 captains chairs (2 yellow and 2 red), yellow BBQ grill, yellow trail bike (motorcycle), 5 figures: Green dad (bald), blue mom (blonde ponytail), red girl (blonde bob), yellow boy (red cap facing forwards, freckles, smiling), Lucky (dog) with red collar. '72-'73 captains chairs do not have triangles on back. # 996 - "Play Family Airport" (Photo) 1972-1976. White and turquoise airport with attached control tower and hinged terminal. 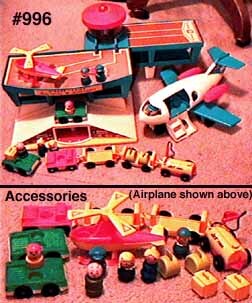 Accessories: Turquoise and white jet airplane (with yellow plastic pull string), orange and yellow helicopter, 4-piece tram (orange and yellow truck and jet fuel car, 2 single-color luggage cars), 2 white/green passenger cars (both are 2 seaters - side to side, with luggage racks. One is white top/green bottom, other is reverse), 2 round green and 2 square yellow pieces of luggage, and 6 figures: Green dad (bald), blue mom (blonde ponytail), yellow boy (red cap sideways, frowning), blue girl (blonde braids), short turquoise stewardess (blonde hair under hat), short turquoise afro-am. helicopter pilot). All people are wood with plastic heads. Variations: boy has cap facing forwards, luggage cars can be either orange or yellow, or one of each, and the green/white 2 seat cars are both white tops in a 1973 ad. # 997 - "Play Family Village" (Photo) 1973-1977. 2-section "town" joined with a trafic light bridge connector between them (can be removed to separate the halves). Building has working garage service lift, working siren and roll-up garage door for fire station, and a gas pump with nozzle. Accessories: Yellow single bed (firemen's), yellow bottom/green top umbrella table, 4 yellow captains' chairs, yellow BBQ grill, barber and dentist chairs (look the same, except dentist chair has a rinse sink on the side), red/blue police car, small fire engine (red top/white bottom, yellow 2-piece ladder), solid top mail truck (says "Mail" on side, and should have "Fisher Price" written on the wheels), 2 green/white cars (a 2 seater - front to back (with fins), and a 1 seater with luggage rack), phone booth with working door, 6 numbered pieces of mail for each of 6 business doors ("address" written in black, stamps in color), yellow sofa and coffee table, 7 figures: Gray mailman, policewoman, black with white arms/hat fireman (with or without freckles), dentist and barber (both look like doctors, one is caucasian, one is afro-am. ), blue mom (blonde ponytail), yellow boy (red cap facing forward, smiling), red girl (blonde bob), and Lucky (dog) with red collar. Variation: Fireman has red arms and white hat, yellow boy is frowning in a '74 JCP ad. 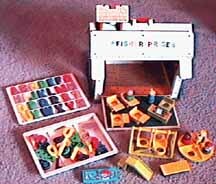 Early sets should have "Fisher Price" written on wheels, and wood/plastic people. '73 captains chairs probably do not have triangles on back. 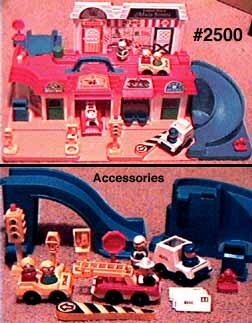 # 2350 - "Play Family Vehicles Assortment" 1985-1990. 24 set assortment includes #124 (Fire Truck) (7), #125 (Police Car) (5), #2450 (Race Car) (7), and #2451 (Motorcycle) (5). Accessories: (See listed individual sets for accessories). 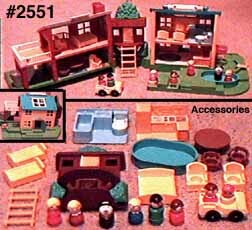 # 2351 - "Little People Mini-Sets Assortment" 1985-1989. 12 piece assortment includes #346 (Fire Truck) (3), #347 (Race Car Rig) (3), #2448 (Farm Set) (4), and #2449 (Airlift Copter) (2). Accessories: (See listed individual sets for accessories). 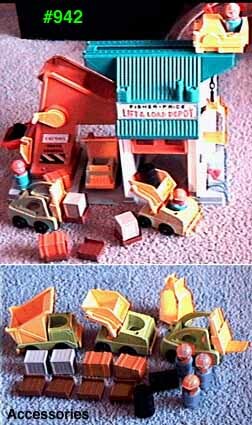 # 2352 - Little People Construction Set (Photo) 1985-19??. Set of construction equipment and people. 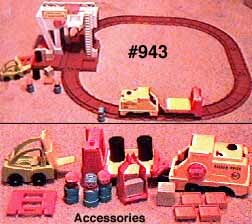 Accessories: Orange/yellow dump truck, scoop loader, and bulldozer; 2 black barrels, 1 gold pylon (2 cones connected by strip), 1 tall light brown crate with wood-look slats, 2 barricades (yellow with black stripes - same as used with #928), 3 light blue body construction workers with orange scarves and hats: 2 caucasian, 1 afro-am. # 2357 - Village Assortment (Photo) 1990-1990. 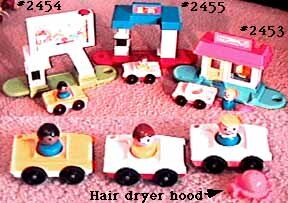 Set includes #2453 (Beauty Salon), #2454 (Drive-in Movie Theater), and #2455 (Gas Station). Accessories: (See listed individual sets for accessories). # 2360 - "Jetliner" (Photo) 1986-19?? (seen in '89 catalog). Yellow/blue airplane with dark plastic (enclosed) cockpit window and a yellow plastic pull string. Accessories: 1 blue round and 1 brown square luggage, 4 figures: blue dad (molded brown hair), yellow mom (brown ponytail), green boy (molded brown hair), red girl (brown hair bob). Other variations: green boy had molded black hair. # 2361 - "Fire Truck" (Photo) 1989-19??. Large red/white fire truck has yellow extension ladder and attached hose reel, and 2 yellow hoses with white end plugs (slides through a hole in the hose reel, but does not detach from the truck). Accessories: Red fire hydrant, 2 black body firemen with white hat and arms, dalmation dog (looks like a dalmation version of the standard dog). 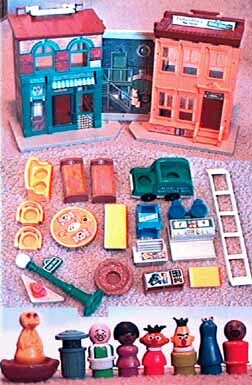 # 2371 - "Little People Mini Set Assortment" 1990-1990. 6-pc. assortment contains 2 ea. of #347 Indy Racer, #2448 Farm Fun, and #2449 Air Lift Copter. Accessories: (see individual sets for accessories they contain). # 2448 - "Farm Fun" (Photo) 1985-1990. Green tractor with yellow wheels and trailer (green axels), or colors all vise versa. Tractor litho is the newer version with black background. Accessories: Feed bag (plastic, looks like burlap bag), tall blue farmer (yellow cowboy hat, red scarf), red chicken (rooster), and Lucky (dog) with red collar. # 2449 - "Air Lift Copter" (Photo) 1985-1990. Blue/white helicopter with litho (same as #635). Accessories: Tall light green pilot with green cap, orange cage (hooks onto helicopter), tall crate (brown wood-look with slats). # 2450 - "Little People Race Car" (Photo) 1985-1990. Race car set. Accessories: Red "Indy racer" car with spoilers in back, black body/black helmet race driver. # 2451 - "Little People Motorbike" (Photo) 1985-1990. Yellow Motorcycle with red handlebars and wide black wheels (like the one that came with the #994 camper). Accessories: Pylon set (2 yellow cones attached by a strip at the base), tall blue bodied driver with white helmet. Cars used in this set do not have the FP logo on the hood, and say "1969-1987" on the bottom. # 2500 - "Play Family Main Street" (Photo) 1986-1990. 1-piece building with 2 levels of street front businesses (post office, fire house, ice cream shop, market and bank). Has pull-up white store-front facade for the 2nd story businesses. 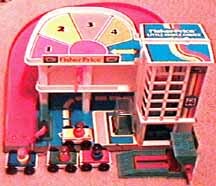 Accessories: 2 blue ramps attach to building to let cars on/off 2nd story, blue mailbox (no litho); yellow parking meter, non-enclosed pay phone, stoplight (knob turns light colors), crossing swing gate (with black stripes); red fire hydrant, stop sign; mail truck with open roof ("MAIL" in red or blue on the sides), fire truck (with yellow ladder that extends), yellow (or yellow/white) 2-seat taxi, 7 numbered pieces of mail for each of 7 business doors ("address" written in same color as stamps), and 5 figures: Black body fireman (white arms/hat), short blue mail man (blue "M" hat), store owner (like Mr. Hooper, but with molded white hair), red mom (blonde hair in bun), green girl (blonde bob). Variations: Mailman can be either tall or short, and was afro-am. in '88. In '90, the storekeeper, taxi, phone booth and parking meter were omitted. # 2501 - "Play Family Barn" (Photo) 1986-1990. Farm building with door that opens making "moo" sound. Plastic farm base. In 1990 and later, farm roof has horse shoes molded into plastic on the roof. This is a reissue of #915 with slightly different lithos. 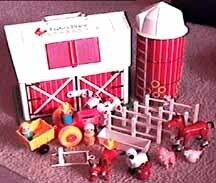 Accessories: Cardboard silo with removable plastic roof (used for accessory storage container), yellow or red tractor and hay wagon (opposite colors), brown horse and white harness, 4 fence sections (newer style, with wood grain on posts), white chicken, red rooster, white cow with brown spots, white sheep, pink pig, brown dog, white water trough, and 4 figures: blue dad (yellow cowboy hat, orange scarf), yellow mom (white hair in bun), red boy (yellow cowboy hat), green girl (blonde bob). Variations: '89 catalog - tractor has old-style litho with black bar on top and 3 colored dots below, and the horse harness appears to have been omitted. '90 - girl, trough and dog were omitted. # 2502 - "Airport" (Photo) 1986-1990. 1-piece building with hand crank that turns the radar and a connection to the helicopter. Gas pump in back, crossing gate in front (omitted in 1990), both attached to building. This is a reissue of #933 except building has green base. 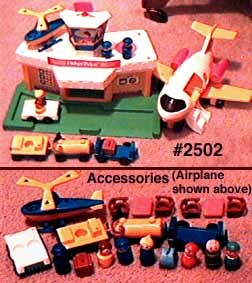 Accessories: Orange/white plane with #2502 on it, blue/yellow helicopter with solid black triangles on rotors, 3-part airport service train (blue/yellow truck and fuel car, blue or yellow luggage car), green/white 2-seat car (side-by-side) with luggage rack, 4 brown captain chairs, 2 orange coffee tables, 1 brown square and 1 blue round luggage, 7 figures: Green dad (molded brown hair), tall blue afro-am. pilot, short blue pilot, tall light blue stewardess (blonde hair under blue hat), blue mom (blonde ponytail), yellow boy (molded brown hair), red girl (rust hair). Variations: Helicopter had blue or yellow rudders and white or black triangles on rotor blades, dad had black molded hair, blue girl vs. red, red girl has brown hair, pilot and stewardess could be either tall or short, and stewardess may be dark blue. '89 catalog shows a yellow luggage car and a tall dark blue stewardess. '90 version omits the stewardess, 1 pilot (leaving 1), 1 table (leaving 1), 2 captains chairs (leaving 2), and the radar antenna and barrier arm. # 2504 - "Play Family Garage" (Red Ramps) (Photo) 1986-1986. 1-piece building with red ramps, green elevator, and masonite base. This is a reissue based on #930. Accessories: Bright lime green service lift (no litho); 4 1-seat cars (white and solid color tops or bottoms in red, yellow, red and green); 4 figures: Yellow boy (red cap facing forward, smiling), blue afro-am. boy (black molded hair), orange boy (molded brown hair), red girl (brown bob). # 2504 - "Garage" (Blue Ramps) (Photo) 1987-1990. 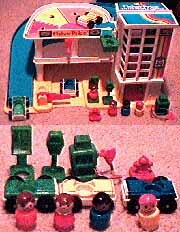 1-piece building with blue ramps, green elevator, and plastic base. Service lift is molded into the base. This is a reissue based on #930 and the previous #2504. 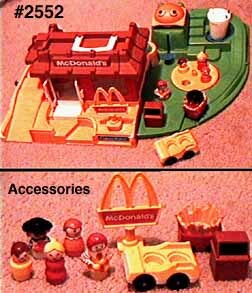 Accessories: Green gas pump, parking meter, and pay phone; red fire hydrant; 3 1-seat cars (white and solid color tops or bottoms - red, green, yellow or blue); 4 figures: Yellow boy (red cap facing forward, smiling), blue afro-am. boy (black molded hair), orange boy (molded brown hair), red girl (brown bob). Variations: blue girl (blonde bob). '90 - Set omitted the following: 1 car (bringing total to 2), 1 person, parking meter, pay phone and fire hydrant. # 2524 - "Cruise Boat" (Photo) 1989-1990. (S. S. Tadpole) chair, fishing line and a green fish are attached to the boat. . 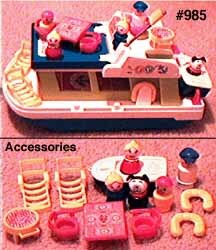 Accessories: 1 white life preserver ('90 catalog does not mention a life vest, but it looks like there is one in the picture), short blue captain with white beard, green boy (blonde molded hair). Variation: Yellow life preserver. # 2525 - "Playground" (Photo) 1986-1990. Green playground set with attached equipment (2 spring rides, a stump, and a jump on to a slide). Accessories: Orange/yellow twirl-a-round and double swing, blue climbing cube, and 2 figures: Green girl (blonde bob), orange boy (brown molded hair). Variation: Orange girl (brown bob). # 2526 - "Swimming Pool" (Photo) 1986-1989. 1-piece plastic pool and deck. Accessories: White diving board with yellow or green base, black BBQ grill (looks like gas grill vs. open coals), tall green or yellow lifeguard chair (has hook on back), life preserver (hooks on chair, white goes with yellow chair, yellow or white goes with green chair), yellow or green slide (also seen in orange), 1 orange and 1 yellow lounge chair, umbrella table with small round bottom (fits in pool base), 2 figures: Green boy (molded black hair), blue girl (blonde bob). Variation: '88 shown with 2 yellow chairs and an orange slide. Umbrella table seen in green/yellow or orange/yellow. # 2550 - "Little People School" (Photo) 1988-1990. Tan base with red school/yellow roof. Steeple pushes to rotate letters and pictures through a window in the roof. Removable green plastic playground slides out from under building. Playground has attached equipment (e.g., balance beam where person twirls as he moves across the beam, ladder and slide, blue teeter totter that makes "boing" sound, etc). Trap door by teacher's desk sends students into the playground below. Accessories: Yellow bus with black "School Bus" letters on side, yellow skateboard (omitted in '90), white flag with litho of 2 Little People figures, orange/red/blue jump rope, white playground drum, red "Walk"/"Don't Walk" sign, box of chalk, and 5 figures: Red teacher with glasses and blonde pony tail, yellow boy (red cap facing forward, smiling), blue asian boy (molded black hair), green afro-am. girl (black hair in bun), orange girl (brown hair in bob, glasses). Variations: '89 catalog shows orange girl and red teacher (neither have glasses), blue boy is not asian. Another variation we have heard of includes red girl with glasses (vs. orange). # 2580 - "Little Mart" (Photo) 1987-19?? (seen in '89 catalog). Convenience store with gas pump, car wash, and auto-open store door. Base is either grey or yellow ('89 catalog shows yellow). Accessories: Red tow truck with orange hook, orange shopping cart, brown bag of groceries (light brown, hollow plastic - base is same size as Little People base, and fits into hole in shopping cart), solid green 2 seat car (back to back) and a solid yellow 1-seat car with luggage rack (see note on car variations that follows), yellow pay phone (non-enclosed), and 4 figures: blue girl tow truck driver (blue hat with inverted U above bill - looks like police woman), green man (molded black hair), blue mom (blonde ponytail), Lucky (dog) with red collar. Variations Unknown, however, one source indicates the set came with 1 solid yellow (1 seat with luggage rack) and 1 solid red (2 seat with fins). '89 catalog does NOT show a second car - only the green one. We suspect there were car variations beyond this as well. All cars, however, should have a rectangular hole on the bottom side, under the hood, where the tow truck hooks to carry the car. Other variations: Blue phone booth, and Red mom (blonde bun) seen in '89 catalog. # 2581 - "Express Train" (Photo) 1986-1990. Engine (white and blue, with red "Fisher-Price Express" litho, red stack and yellow horn button), green and white flat car with "Freight" on litho, red and white caboose. All wheels are black. Accessories: 2 cars fit on the flat car (1 seat solid yellow car with luggage rack, and 2 seat back-to-back solid red car with fins), 2 pieces of luggage (blue round hat box, yellow square), blue mom (blonde ponytail), green dad (black molded hair), Lucky (dog) with red collar, and light blue engineer (red scarf, mustache). Variation: Red mom (black pony tail), engineer was tall or short. '90 - both cars and Lucky were omitted. # 2582 - "Floating Marina" (Photo) 1988-1990. 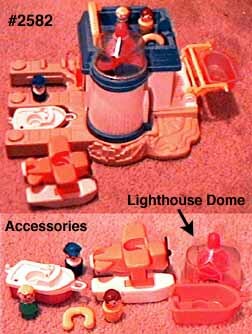 Building has detachable clear lighthouse dome with red knob on top to move light, and a yellow carrying handle that folds down on roof. 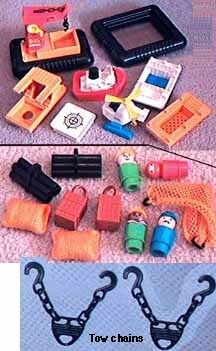 Accessories: Orange sea plane with white floats and black 3-blade propeller (plane omitted in '90), 1 yellow life vest ('90 catalog does not mention a life vest, but it looks like there is one in the picture), orange open lifeboat, red/white boat with steering wheel, and 3 figures: Short blue captain with white beard, red girl (blonde bob), green boy (molded brown hair). 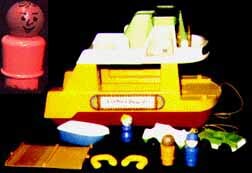 Variations: Open boat is also seen in yellow, and other boat is also seen in solid red, green girl (blonde bob) seen in '89 catalog, yellow ('89 catalog) or coral boy (molded brown hair).